But WAIT--before you check out the interview, please be sure to download the most current free version of Quicktime (for Windows or Mac), to enhance your experience. On some computers, the interview will open and play right away. On others, it will take a few minutes to download. Hang in there, it's worth it! 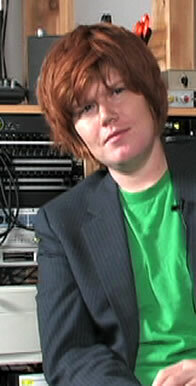 It's months now since we talked with young Brett Dennen at Puremusic Studios on Music Row in Nashville. A towering boy man with a gentle knowing presence, I found him otherworldly in a comforting way. He was very humble for such a gifted and self-assured youth. Very West Coast, very home schooled, if you know what I mean. He wasn't and he isn't like the other kids. He came in contact with and looked into things that interested him in a different way than the schoolyard and the TV and peer pressure. There is an unmistakably unspoiled, unstupid, uncorrupted way about him that I found curious and uplifting. His music is so good that it's hard to pick favorites to include with this interview, and that's rare. (Hear audio clips on our Listen page from his CD So Much More.) As we've mentioned in previous writings about him, his songs rather quickly began to appear on TV, Men In Trees, Grey's Anatomy (the new litmus test), and probably new ones since then. And he was hitting the radar of people like John Mayer, who spoke glowingly of him and his music in the press, and he insisted he open the tour that Mayer shared with Sheryl Crow; though it sometimes meant a side stage or playing while the crowd came in, he was gaining exposure and getting airplay, and press. And Brett is on tour now in the UK, and then opens a bunch of West Coast dates for John Mayer, so the saga is still on the upswing. His records and performances are touching people in a very unusual way; he's connecting. That's the product of the purity of his channel. We believe in this guy. And we think you will, or you do, too.